Canines worldwide were shocked by the juvenile display by the powder puff that stole the top dog award from a deserving Pembroke Welsh Corgi named Coventry Queue (Photo below right) at the 125th Westminster Kennel Club Show. "First he barked, then he was high-fiving the air and I almost fainted when he climbed in the silver bowl he just won", said a Australian Shepherd who chose not to be identified. "That's stuff that cats do!" A miniature pinscher named Rocky called the Bichons "a cotton ball with a thyroid problem". "My money was on Coventry or Ridge Runner, the bloodhound", said Standard Schnauzer finalist Charisma Jailhouse Rock. "A lot of the humans were cheering for him." There was speculation that the Westminster may not be the "equal opportunity" show it claims to be. Out of 7 dog groups, one group has won Best In Show a whopping 46% of the time. I know we're all dogs under the fur, but I have never really liked terriers. Oh, sure I have known some nice terriers but many of them are just yappy little beasts. And, while a Bichons won this year, most of the smart money was on a Kerry Blue Terrier to win again. I think something's very wrong here. 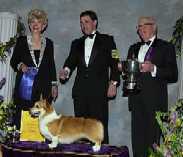 But the show did confirm that the Pembroke Welsh Corgi is the number one herder (which we already knew). So I'll leave you with another picture of Coventry Queue.